​Using a tanning lotion is a very important step in the tanning process. There are many different types of tanning lotions that will help you achieve the color you're looking for. From accelerators to tingle lotions, we have a variety of the finest tanning lotions the industry has to offer. Our educated consultants will assist you in choosing the lotion that is perfect for you. ﻿﻿Preparing and maintaining your sunless tan correctly is very important in order to achieve perfect results. We use Norvell® Sunless Solution, the finest in the industry. 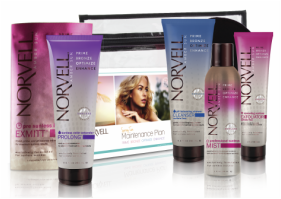 We also sell Norvell® products that are uniquely formulated to enhance and prolong your sunless spray tan. ﻿Pure Natural Hemp Seed Oil is the secret to maintain your tan! It's unique molecular structure is very similar to your own skin, thereby, helping to enhance your skins ability to heal, rejuvenate and stay youthful. Hemp Seed Oil is 100% natural, Paraben-Free, Gluten-Free, 100% Vegan, and has the perfect balance of proteins, vitamins, antioxidants and essential fatty acids that your skin craves for healthy conditioning.